I’m going to try to keep this review spoiler-free, but just in case I get ahead of myself, be on the lookout for these [SPOILERS AHEAD] warnings if you haven’t seen the movie yet. For the record, I’ve seen the movie 3 times now, once in IMAX 3D, and let me tell ya…IT WAS WORTH IT. I LOVED this movie. Raimi’s Spider-Man 2 will always will always have a spot in my heart as far as Spidey movies go, but I TRULY believe that Marc Webb did an awesome job with Amazing Spider-Man 2. I’ll break it down for you. There’s a few plots in Webb’s Spidey universe, ranging from Peter’s Parents’ fate, Oscorp’s plans, and Peter’s life both as Spider-Man and Peter Parker. Webb does a good job with the pacing of the film, even though it sometimes seems rushed at times. We discover the fate of the Parkers and why they had to leave Peter with Aunt May and Uncle Ben that night they left. We also discover why the spider bite is only compatible with Peter and not with any of the human trials Oscorp performed behind closed doors (hence, why there are no Spider-MEN crawling around New York). We also see Peter juggling life as Spider-Man and as a college student and being Gwen’s boyfriend. Keep in mind the promise he made (and then broke) to Gwen’s father and how Peter being Spider-Man would endanger those around him. Although we never see Peter attend college, let alone step inside the Daily Bugle to talk to JJ about his Spidey pictures, there are subtle hints to show his struggle, such as Aunt May going to school to be a nurse to help pay for Peter’s college expenses and JJ’s emails to Peter about Spider-Man. The chemistry between Andrew Garfield and Emma Stone as Peter and Gwen is beyond compare to Tobey and Kirsten in Raimi’s trilogy. Raimi’s Spidey universe depicted MJ too much as a damsel in distress and by the 3rd movie, it had become predictable as to what she would portray besides a love interest. In Amazing Spider-Man 2, we see Gwen not as a damsel in distress primarily, but a strong love interest who helps Peter overcome his enemies through the use of her knowledge in science (“That’s why he’s #2”, as Gwen would say). The enemies and their development could have been done better, particularly Harry’s take on the Goblin and the portrayal of Rhino. I think Dehaan’s take on Harry Osbourne was better than James Franco’s in a way that Dane played the menacing role more believably than Franco. To me, there wasn’t enough screen time of the Goblin and Rhino, which leads me to my next character: ELECTRO. Jamie Foxx did an EXCELLENT job playing both Max Dillon and the Electro. He was able to show how Max as an introvert affected his life at home and at work and how he is unnoticeable to everyone (especially on his birthday). As Electro, he unleashed all the anger and fury he felt as the isolated Max Dillon. The scenes with Peter swinging through the city are worth the price of IMAX 3D. It’s not from his point of view as it was in the first Amazing Spider-Man, but seen from his chest as if he was wearing a GoPro. The fight scenes are SPECTACULAR. Definitely worth watching in IMAX 3D as well! From the choreography to the CGI effects, it will definitely leave you feeling satisfied. I don’t want to say too much about it, except that there’s no way to describe it other than telling you guys that you have to see it! Now, I’m going to talk about a particular scene in the movie that took my breath away. One that was closely adapted from the comic book. You’ve been warned! The way Webb depicted the death of Gwen Stacy in Amazing Spider-Man 2 couldn’t have been done better. The whole scene leading up to it with Peter struggling to keep a hold of her and fighting off Harry at the same time gave the scene more of a feeling of desperation…and you could feel it, too. Inside, you know what’s coming, but at the same time you’re thinking to yourself “C’mon, Peter. Don’t give up. DON’T LET HER GO!” And as she falls in slow motion, there’s no music. There’s no sound in this scene other than Gwen’s last breaths as she’s falling and the sound of Peter’s web shooting out like a hand begging to reach her in time. I was holding my breath the entire time Gwen was falling and sat at the edge of my seat with my heart beating as if it was going to jump out of my chest. This is how I felt when I read it in the comics. Only this time, it was more intense. This time I could hear Gwen’s body snap as her head hit the ground and see her lifeless body hanging on the web. What made the scene even more emotional was seeing Peter’s reaction as he held Gwen for the last time knowing that maybe…he could have saved her. Maybe. To me, this is the best Spider-Man movie done so far. There’s enough emotion, action, and story to continue on to the next Amazing Spider-Man movie. If you haven’t check out the movie yet, YOU NEED TO! You won’t be disappointed…unless you’re looking for a certain character to survive at the end. And that’s as spoiler-free as I can get! GET TO IT! Panda Discussion: Will Amazing Spider-Man 2 Depict The Night Gwen Stacy Died? DAMN! That’s all I gotta say about watching part 1 of The Amazing Spider-Man 2’s Super Bowl trailer. The end of that trailer really gets to me because I KNOW Gwen Stacy is going to die in the sequel. And if she doesn’t, well…it wouldn’t be a bad thing really. The movie itself would become…just like the Raimi’s trilogy where Peter gets the girl in the end. To be honest, I don’t want to see that again. I mean, if I wanted to watch a universe where Peter defeats his enemies AND gets the girl without making GREAT sacrifices, I’ll stick to Raimi’s Spider-Man. BUT…the thing is…I want to see Spider-Man taken to a dark place. A place so dark that we no longer recognize the Peter Parker we’ve seen in Amazing Spider-Man Part 1, but a Peter hellbent on vengeance (and no, I’m not talking about the “emo” Peter we saw in Raimi’s Spidey 3). 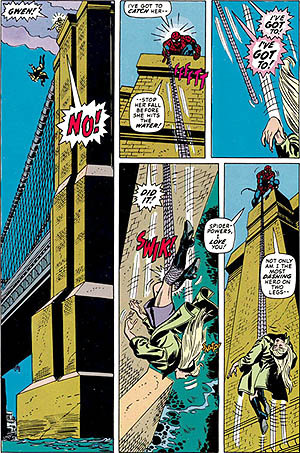 According to Marvel Comics editor at the time, Roy Thomas, her death was caused by a broken neck from the whiplash during Peter’s attempt to save her, in which he used his webs to stop her from falling to her death, which was instigated by the Green Goblin. Believe me now? I hate to say it, but we may be saying goodbye to Gwen Stacy in the next Spider-Man film. And it’s such a shame, too. I LOVE EMMA STONE and I think the chemistry with her and Andrew is WAY better than that of Tobey’s and Kirsten’s. Maybe this is why Marc Webb scratched the idea of including Mary Jane Watson in this sequel and pushed her to part 3…which would make MJ look like his savior…or better yet, Peter’s salvation. What do you guys think? 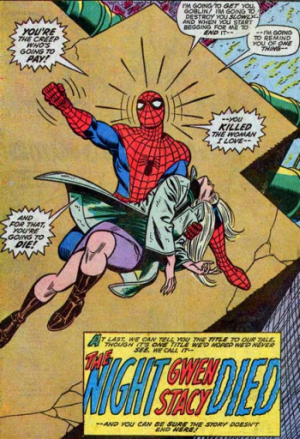 Will we see the death of Gwen Stacy in the next Amazing Spider-Man film?